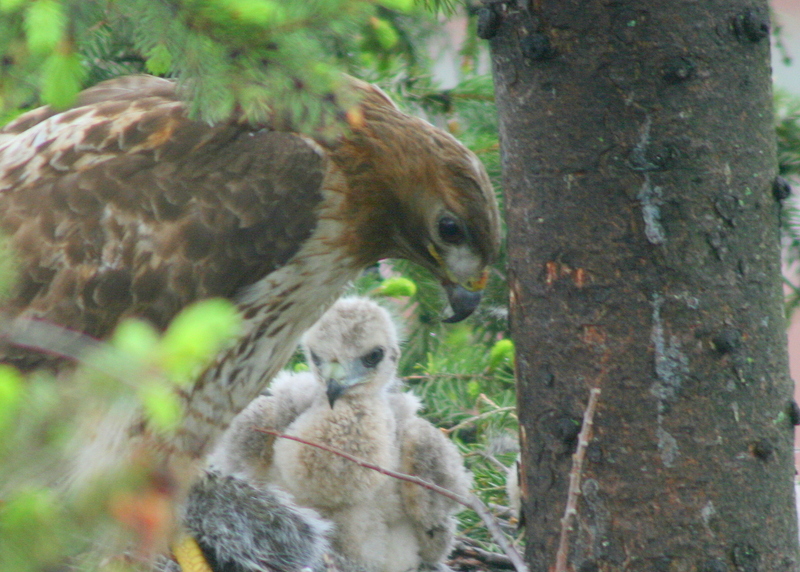 Red-tailed hawk chicks continue to grow….. According to Birds of North America, developmental asynchrony among chicks (runting) and sibling aggression may occur when food is scarce. At a nest where food delivery was low and one chick was dominant to its nestmate, the female parent preferentially fed the dominant chick and frequently pecked the subordinate. There was violent sibling aggression in this nest, and the subordinate chick did not survive to fledging. Young are generally fed the same foods as adults eat. Early in the nestling period, adults typically remove unused prey from the nest within a day of deposition. In contrast, old carcasses may be allowed to accumulate in the nest late in the nestling period. ← Merlin….threat to peregrine chicks?